Teachers have a unit of specific content and skills; they give homework assignments, which we would call formative key performance indicators (KPI’s), and from grading those, they measure how many students are “getting it” and how many are not. If they are not getting the results they want, they devise ways to teach the content and skills differently. Ultimately, they give a test, and they use the results of that test to determine not just student grades but to measure their own effectiveness. If grades are not good, they decide to re-teach the content or skills in a different way, in order to get the results they want. KPI’s for content marketing should be handled just like this. 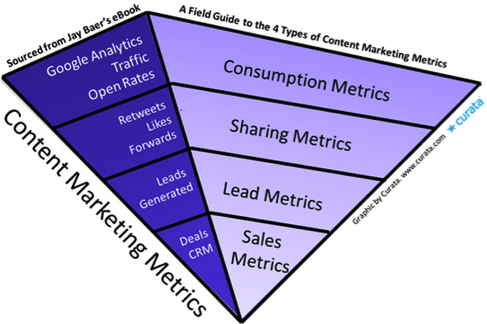 So, how do you go about measuring your content marketing? The key is to take an organised approach to identifying the goals of your activities and then use the best tools to analyse their performance. 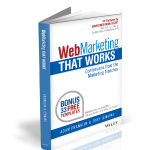 Obtain, Nurture and Convert Leads? Probably, you would say that every one of these goals is important for your business growth, and you would be right. So, how is your content marketing contributing to achieving these goals? If you cannot answer that, then you need to put in place a framework for measuring the performance of that marketing in achieving your goals. There are four metrics you really want to track and measure – consumption, engagement/sharing, lead generation (part of conversion), and sales (the rest of conversion). Here is a great graphic from Curata.com that identifies these metrics and suggests the type of performance indicators to be used. How many page and post views are you getting? How many video and podcast views? How often and how in-depth is the consumption? How do you measure these things? As the graphic shows, you should be using Google analytics to track these things. Here is an example of the use of analytics to track consumption information. Given information like this, you may then want to dig deeper into the information. For example, you may not be pleased with the fact that only 1.74 pages are being viewed and you may not be pleased with an almost 70% bounce rate. There are deeper reports available through Google Analytics, but you may want to use something like Crazy Egg to view “hot spots” and those spots from which visitors are bouncing. This can drive changes that you make to your content, in order to keep visitors from leaving so soon. Other helpful tools for tracking consumption metrics are Marketo, Eloqua or Pardot. How many shares, likes, retweets, forwards and comments are you getting? If your content is getting shared, you are on the right track, because visitors only share content that is really useful or entertaining or that will make them look good. You definitely want to keep track of your shares, so that you know which content is working and which is not – you can then fashion additional content based on the most popular. You can use something like SharedCount to get an accumulation of shares across all platforms as well as indirect re-shares. Email forwarding cannot be directly tracked, but you can put a sharing button in the email itself and that can be tracked. You need to know if your email newsletters are worth it – they take time to produce, and if they are not working, then it’s time to evaluate the content. Engagement is not included as a separate category in the graphic shown above, but it is, nevertheless, a critical element that must be measured. Every time you add a piece of content, you are beginning a sales campaign. And when something happens (e.g. Someone clicks on a CTA from that content), you need to know this. You have no way to assess the value of any content unless you know if it is moving people into your funnel. Multiple Attributions: There may be multiple pieces of content that brought in the same lead. You need to know this too. Time-Stamping: This will tell you what the last piece of content viewed was before that visitor moved into the funnel. How many new leads came from a piece of content? Were there more than average (obviously effective content) or less (not-so-effective content)? Did those who are current leads also access that content? If so, how many? If you use Marketo, you can get this data, and that will give you great information regarding the effectiveness of each of your content campaigns (specific web pages, outside paid ads, blog posts, email, etc.). This would all be good information to have, obviously, and most likely drive a major change in your content marketing strategy. Sales is an easy metric to measure, if you have your lead generation analytics in place. When a lead that was generated by a piece of content becomes converted to a sale, then obviously that piece of content is effective. What you now want to know is the amount of revenue, not just the number of sales, which resulted from specific content and the percentage of all revenue that came from certain content. Revenue is closely linked to the bottom line for any business, and if content marketing is to be justified, its “chunk” of that revenue must be measured. Perhaps you are not happy with revenue generated from your content marketing campaign. This does not mean that you should dump your content campaigns. It does mean, however, that you need to take a good long look at what types of content are generating strong revenue for other businesses in your niche and determine how to implement the same strategies in yours. Content marketing is here to stay, and it will become more and more important to engage and convert visitors into customers. Using the right analytics to evaluate your content campaigns can give you the information you need to make your content a successful piece of your overall marketing strategy.